The legal industry is an area that is always actively looking for new clients. While some legal firms survive through retainership, most lawyers need a steady stream of new clients. In short? SEO visibility is a must. So, how can an SEO agency have a lawyer or legal firm? Let’s find out. Depending on the exact nature of your business, your SEO efforts will likely change. The former needs to focus on location. For instance, a legal firm based in Manchester is not going to be of any use to someone in Dorset seeking representation in court. As such, the keyword targeting should focus on location-specific terms, with website optimisation to match. As for the latter, you should seek specific cases. Someone looking for due diligence, mergers or copyright infringement, for instance, will seek these terms. You need to highlight the areas you specialise in and focus on improving the visibility in these areas. They might seem like long tail terms, but they also represent people who are already looking for a lawyer and, consequently, more likely to convert into paying clients. Another area worth addressing here is content. When looking at the available keywords and queries, you might find a significant number of questions. As part of the keyword analysis, tools like Answer The Public can also show some commonly asked questions. Giving people answers. People searching for such answers likely have a need so, after reading your content, they may contact you for more help. Establishing an expert voice. This improves your authority, which can help your overall standing on SERPs in regards to the subject. Outreach efforts! A good resource will be used, linked and shared by others, increasing your overall exposure and visibility. This will likely help legal firms with a wider reach, specialising in specific areas, but don’t be afraid to use it in local scale options either. For example, if your company can offer real estate legal solutions in Newcastle, this can still easily be included. A specific page for various services can make it clear that you offer these expertise, while also giving you the means to demonstrate your knowledge. Finally, one last thing to consider with the legal industry is whether you are operating as a business to business (B2B) or business to customer (B2C) – maybe even both. For the former, you should use higher terminology and focus on in-depth articles, case studies and other factors that help your conversion rate. These types of media also tend to circulate well on journals and business websites. B2C, on the other hand, may have better success with additional social media engagement and more simplified content. It’s all about adapting to your target audience to ensure you increase your visibility while ensuring the right people visit your website overall. he SEO industry has been growing rapidly since the introduction of its necessity for thousands of advertising websites. Its investments have grown over $60 Billion and it doesn’t plan to go downwards anytime soon. Components vary on why the SEO industry stands strong. But one reason that remains at the top, is due to the growing number of internet users. With these facts behind us, another field that requires SEO services is the law firm industry. Most firms have been implementing their own websites to allow local online visitors to get a good grasp on how the legal business works and enlightening the people to trust their lawyers, knowledge and actions. It’s basically the same as advertising products but firmer this time. We can help increase the search engine rankings and site visibility of any company. The expertise offered by our expert technical and copywriting team enables us to successfully meet the needs of law companies with complex website requirements. 1. Analyse a website: We first analyse your website, followed by a step-by-step marketing plan to have the website indexed for its keywords more effectively within search engines. Our ultimate goal is to get our clients more visitors, traffic and higher conversion of sales and leads. 2. On-page and Off-page Optimisation : The goal of our on page and off page optimisation is to get your site ranked highly for its targeted keywords. The search engine is a robot, not a human ... and therefore, you must follow our proven process to educate the robot so that it brings your website at the top when your potential law customers are searching for specific law related keywords. Before beginning an SEO project for your law firm, it is important to understand the process involved for an effective SEO campaign. 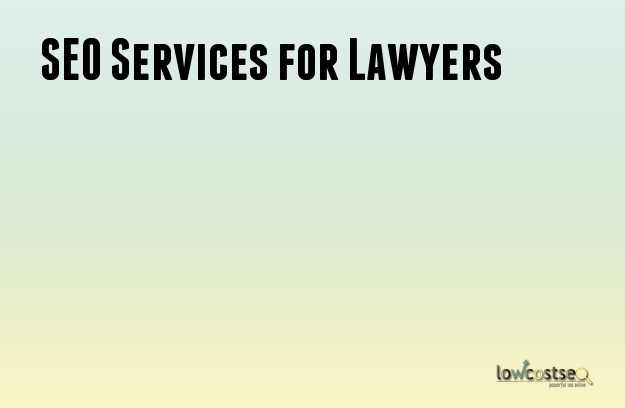 Lowcostseo caters to lawyers who require an intensive, full-service approach to search engine marketing. Numbers: Because a billion people depends on search engines these days and most of them are the ones who are in dire need of legal help. They often proceed to legal actions after. Recognition: As a company generates its website, it will require future clients. By doing so, we need to be on top of the local rankings in order to be quickly recognised. Receiving traffic for your site will mean more online visitors. Gaining more online visitors is equals to more clients and so on. Competition: The sense of competition is also acquainted with the reasons, because law firms have already upgraded their SEO rankings and the remaining ones will eventually follow through. If a law firm or an attorney intends to improve their SEO ranking but cannot due to a load of cases, collaborating with a legitimate SEO service company is the first step. Our company’s expertise is to comply and maximize the SEO needs of complex websites in competitive industries. We are updated with the consistent changes in search engine algorithms and updates to make sure our services are legal, exponential and accurate.